The next entry in the Arkham series has been outed by UK retailer GAME – and marks the return of Asylum developers Rocksteady to the streets and vents that made their name. 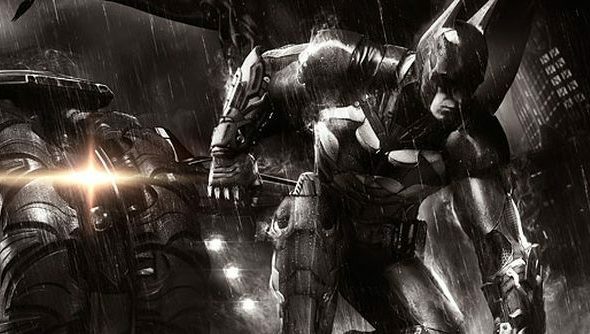 Batman: Arkham Knight is due out on the PC and the new consoles before the end of the year. The game was uncloaked by Videogamer via a GAME site listing, but versions for the creakier Xboxes, PlayStations and Wiis haven’t been mentioned. We can only hope that means an undiluted showcase of the perma-struggling city that makes the most of the PC’s powers. It was believed that Rocksteady had passed full ownership of the series to new outfit Warner Bros Montreal ahead of last year’s Arkham Origins. Instead, it would now seem the games are in for annualised iterations – with the two studios engaged in a continuous one-two punch a la Assassin’s Creed and CoD – but for a line in the listing which called Knight an “explosive finale to the Arkham series”. The Bat will “face the ultimate threat against the city he is sworn to protect,” reads the blurb, spotted by TheSixthAxis. Another large gaggle of supervillains will make up that threat – led by the Scarecrow, and including Penguin, Two-Face and Harley Quinn. The latter has a related pre-order bonus. The Batmobile’s on the cover, and will be drivable for the first time. Which changes the nature of Arkham traversal somewhat, doesn’t it?